Enchanted is the next step up from Harmony in our wedding packages. With upgraded drinks and food packages as well and extra accommodation for the parents you can see why this package is a very popular choice. You will have our wonderful wedding co-ordinators to guide you through your wedding planning as well as a master of ceremonies to preside over your special day – nothing is too much fuss! 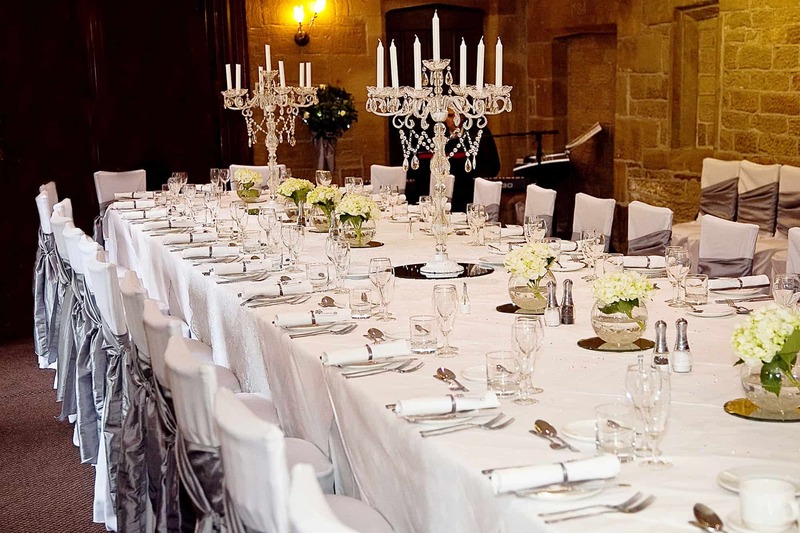 The room hire for the whole day is also included – ceremony, breakfast and evening reception. You will feel like royalty with a red carpet entrance for your ceremony or arrival from church. Your allocated hotel grounds will be available for your photographs throughout the day. All cutlery, crockery, glassware and crisp white table linen is provided as standard for your wedding breakfast and our cake stand and knife can be used to give your cake that lift and extra beauty. Our resident DJ will preside over the decks for your evening reception up-until midnight. Check out the drinks package, dining options, evening buffet options & accommodation deals we have included in this package below. The enchanted package upgrades you from Bucks Fizz to a glass of Pimms cocktail or a Prosecco drinks reception following your ceremony or arrival from church. Orange juice will be provided for any children or guests that don’t wish to drink alcohol. For your wedding breakfast you and your guests will enjoy an extra glass of wine giving you two glasses of Sauvignon Blanc or Tempranillo wine with the meal per person. You will also toast your speeches with a glass of fine Italian Prosecco. Our bar staff will also circulate with orange juice for the children and adults not wishing to drink alcohol. With the upgrade to Enchanted we also include a chilled bottle of house champagne in the bridal suite for you to retire to at the end of your day. For your three course wedding breakfast you will choose one of the following options for all of your guests to enjoy. All Harmony menu items are available for no extra cost. Vegetarians and other special dietary requirements can be catered for separately. The Enchanted package includes an upgraded evening buffet for all your evening guests as below. If you’ve seen something on the harmony buffet that you like don’t worry, all harmony buffet items are interchangeable at no extra costs. Hot roast pork or beef rolls served with homemade paprika spiced wedges, spicy garden slaw and a mixed salad. Included in the Enchanted package is one of our two luxurious bridal suites for the night of your wedding as with the Harmony package. Additionally, with the Enchanted package we will provide complimentary rooms for two sets of parents with full English breakfast assuming full bedroom allocation is taken. You will have the option of an early check in from 11.30am for the Bridal suite so you can get ready in your room if you choose to do so. Following your special day you and your new husband/wife will retire to your cosy bed for the night. The following morning you will wake up to a delicious full English breakfast with the rest of your party or if you have stayed alone we will bring it to your room for you to devour in bed – free of charge! Preferential accommodation rates for all your guests. Sign up for free to become a member of our Platinum Club. Every month you will receive exclusive member-only special offers, invitations and deals. Yes! I would like to receive updates about promotions, special offers, news & events from Whitley Hall Hotel.